153 other birds have this item in their bag or wishlist! I've heard fantastic things about Turkish towels so I thought I would buy one. I washed prior to use and hung it outside in the winter sun and it dried in 10 minutes. Amazing! I did use it after a shower to try it out and it was lovely. Not as absorbent as my Sheridan towels but still fantastic. Plus it dried much quicker. As I had purchased the other colours for friends and family, this was the last colour left. I was very pleased that it is brighter than appears in website. Lovely weight and quality. Very pleased with this. Have bought lots of these towels for all my friends. Everyone should have one in their luggage, in their car, gym bag etc. An almost vital item - at least for every camper, beach lover. great for gifts, i love the colours and they're practical and very compact! Perfect light weight towel for the beach or pool and to take on holiday. Love it! I purchased two of these towels as gifts for friends for Christmas. I somehow thought they would be a bit softer and thinner. I hope they loosen up with a wash.
Fabulous towels. I bought 4 different colours and we have used them for a variety of purposes - towel, sarong, table cloth, light blanket. So many uses and so soft and easy to look after. 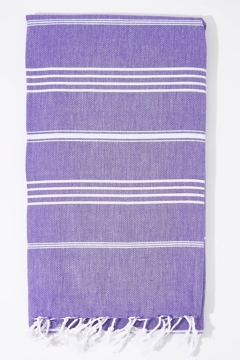 Love these towels as they are very light weight and easy to wrap around your waist at the beach to use as a sarong.